National Committee of SIO has collected records of Questions and Answers in Lok Sabha from July 2014 to March 2015. I should congratulate the organizers of SIO for having categorized the documents on sub topic wise. The whole of the documents are related to literacy and school education and the sub topics are literacy, enrolment of children, infrastructure in schools, teacher vacancies, posting and training, measures for disadvantaged sections of the society and mid-day – meal and such other student support measures. The committee must have expected that there should be serious discussions in the top most legislative body of the nation in the interest of educational rights of the people and for the progressive development of the society on the basis of the values enshrined in the preamble of the Constitution of the land, democracy – equality, equitable opportunity and affirmative action of the state, secularism – right to faith, right to ideology, right to disseminate beliefs and ideologies, recognition and democratization of all religious and cultural identities and recognition and development of all languages and dialects and socialism – equal rights over means of production to really become equal. The National Committee of SIO must also have believed that Parliament of India is very conscious of the sovereignty of the country. It also must have believed that Parliament must be discussing seriously on the growth of self-centrism in the students due to commercialization of education which reduced most dynamic, progressive and selfless sections of the society to one of self-seeking lot. Dear friends, I should tell you the truth that the experience I gathered wandering through the discussions in the Lok Sabha through the documents you have supplied to me is utterly disappointing. Of course, the documents that you procured include lot of statistics which can be used for advocacy both at centre and in states. The questions are repetitive and the answers are one stereotypical. The answers essentially included select paragraphs from the introductory chapters of different Legislative Acts and Centrally Sponsored Schemes and some statistics. No question was raised on the policies of the government. In the provided papers, I could not find any question against commercialization, globalization for trade, centralization of decision making, bureaucratization of campus life and safranisation of history and reduction of education to one of skill and professional training. No question was raised against siphoning of public funds to private operators through the schemes of Public Private Partnership (PPP). No question was raised against the possible commitment for market access to World Trade Organisation (WTO) in higher education sector. Again Parliament spent a minute on the growth of self-seeking mind in the youth. However, let me place a brief summary of the questions and answers on some sub-topics. Literacy: In response to a question raised by a member of Lok Sabha, HRD Minister, Smt. Smriti Zubin Irani, in her course of answer stated that ‘in order to improve female literacy rate in the country, Government is implementing Saakshar Bharat Programme since October 2009 in rural areas of all districts that had adult female literacy rate of 50% and below as per the census of 2001, including left-wing extremism affected districts, irrespective of their literacy rates, including 60 million women and with special thrust on disadvantaged groups. Saakshar Bharat Programme addresses age group of 15 years and above. The target has been set to raise the literacy levels to 80% and to reduce the gender gap to 10 percentile points, besides bringing regional disparities, by the end of XII Five Year Plan (2012-17). Government in India take targets, spend money in the name of the projects and produce records of completion of the targets but we never find any real change on the ground. Many persons who are listed as literates by government agencies not only cannot read newspapers but also cannot write their own name properly. 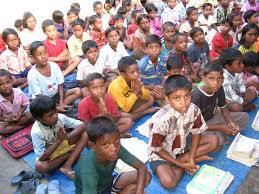 As per the census 2011, the rate of literacy is 72.99 with Male 80.89 and Female 64.64. But, if we make a survey in the field, situation will be found far away from these figures. SIO may go for a sample survey in few villages and bastis and compare their results with that of the statistics provided in the census tables by government. Enrolment at Elementary Stage: In response to a question (Q. No 2076) raised by Shri Om Birla, a Member of Lok Sabha on 23rd July 2015, the HRD Minister stated that ‘the Right of Children for Free and Compulsory Education (RTE) Act, 2009 mandates free and compulsory education to all children in the age group of 6-14 years in the neighbourhood school till the completion of the elementary education of satisfactory and equitable quality. Andaman Nicobar Island and Lakshadweep are the two UTs which have reported universal enrolment and there are 20 states where the number of out of school children is less than one percent of the total child population’. Further, the annexed table shows that only 0.85% of children in the relevant age group 6 – 14 years at all-India level are ‘out of school’ during academic year 2014-15. But, these statistics are highly inconsistent. The same can be established from the dropout rates provided in another table which is annexed to the answer provided to another question raised by another member of the Lok Sabha (Shri Ponguleti Sinivasa Reddy) on the same day by the same minister. The minister states that ‘according to the District Information System for Education (DISE), 2012-2013 (Provisional), the annual average dropout rate for the primary level was 4.67%, for upper primary level was 3.13% and for the secondary level was 14.54% during 2012 – 13, in the country’. When the dropout is so high, how come it that the out of school children make such a small percentage as 0.85% for the same age group. Two years do not make such a great difference in a country like ours in the area of education. Measures to check dropout: The HRD Minister in course of responding to Sri Ponguleti Sinivasa Reddy (MP) referred above gave an elaborate answer regarding the steps taken to check dropout of students from schools. “The Central Government is implementing several schemes in collaboration with state governments to ensure educational development in the school education sector. The Sarva Shiksha Abhiyan (SSA) is being implemented in accordance with the norms and standards of the Right To Education Act (RTE Act, 2009) to enhance enrolment and retention of children, with context specific interventions for SC/ST students and a multi pronged approach for reducing drop-out rates. This includes, inter-alia, strengthening of school infrastructure and facilities, residential hostel buildings for children in habitations not covered by regular schools, provisioning for additional teachers, regular training of teachers, provision for free text books and uniforms for the children. The Kasturba Gandhi Balika Vidyalaya Scheme (KGBVS) providing for setting up of Residential Upper Primary Schools for Girls from SC, ST, OBC and Minority Communities. The Mid-Day Meal Scheme (MDMS) is also being implemented with a view to enhance enrolment and retention of children in schools. Further, the Rashtriya Madhyamika Shiksha Abhiyan (RMSA) which has been launched for universal access to secondary education aims at removing gender and socio-economic disparities in access to education. The National Scheme of Incentive to Girls for Secondary Education (NSIGSE) launched in May 2008 seeks to reduce the drop outs and to promote the enrolment of girl child belonging mainly to SC/ST Communities in secondary schools. Enrolment drives in areas having concentration of SC/ST groups, special coaching/remedial teaching and sensitization programmes are sum of the other measures undertaken under RMSA to reduce drop-out rate.” Sorry for quoting the minister at length. This is quoted in full because this is the stock answer, in essence, which the minister advanced for each and every question raised in the Parliament. Schemes are many but all are deficient and poorly implemented and so are not fetching any plausible results. After implementation of SSA for fifteen years, RMSA for six years and RTE Act for five years, the condition and infrastructure and facilities remain very poor. The poor condition of facilities is well displayed in an answer of the minister to another question (Q. No 329/25th Feb, 2015): ‘2,03,318 schools do not have toilets, 5,57,882 schools do not have electricity, 54,553 schools do not have water and 5,21,893 schools do not have playgrounds in government sector.’ Aren’t the figures speaking a bitter truth? Policy Perspective: If government really want to check the drop-out of schools and develop quality in education it should implement the following norms: a) the buildings and infrastructure and facilities of the schools should be developed to a standard level, b) there shall develop a situation where girls and children with special needs are provided with all facilities according to their needs, c) students’ support measures like nutritious mid day meal, uniforms and range of other measures are to be upgraded, d) qualified teachers in sufficient numbers shall be appointed on regular basis, e) the course content and pedagogical practices are to be developed to properly engage the students of all backgrounds and f) mother tongue of the student shall be made medium of education minimum at school level to start with along with effective teaching of English as subject both in government and private schools. Providing equitable and quality education and democratizing education is possible only when commercialization of education is abolished and Common School System is established throughout the country. To start with, at the minimum government schools shall have all the provisions enumerated above and the policy of deploying mother tongue as medium of education should be universally implemented. However, government does not have any policy in this direction and unfortunately no MP raised questions on these policy matters. No number of schemes can replace a proper public policy. Teacher Vacancies and Quality Education: The great scientist Einstein said that the purpose of school was not to produce skilled young persons and rather it should produce persons with inquisitiveness. The school should develop thirst for knowledge. Really, a quality school education is that which develops knowledge, creativity and analytical approach for building a just society that can live in peace and prosper. These finer qualities cannot be developed without teaching of proper subjects like social sciences, natural sciences, literature and fine arts. In fact, all subjects are to be taught to the children with a view to develop thinking faculty in them and also for developing them into good social beings. But our schools are developing aversion for books and critical study. The concept of quality in education is reduced to one of obtaining marks and ranks and which in turn are obtained by mugging up lessons. No question in the Parliament was raised on the very purpose of the education and pedagogical methods. In any case, quality education cannot be provided without a class teacher for each class at primary level and subject teacher for each subject at secondary level. Again it requires additional and trained teachers for sports and fine arts. RTE Act, 2009 which is under implementation from 1st April 2010, only provides two teachers in primary schools with enrolment less than 60. Under this Act, 80% primary schools in India get only two teachers for five classes. Again, the Act provides only one teacher to teach mother tongue of the child, Hindi and English at upper Primary level! Even the two teachers as provided by the Act for five classes in primary schools are not posted regularly. Lakhs of posts are left vacant for years together. Let us see the facts. In course of responding to a question (Q. No. 1536/4th March, 2015) in the Lok Sabha, the minister for HRD provided the statistics of vacancies of posts. They are 4,97,033 posts! Again, government agreed responding to another question (Q. No. 350/25th Feb, 2015) that 4.5 Lakh under-qualified teachers are working in 19 states/UTs. How can government schools achieve any quality in education on the basis of an Act with such poor provisions and that too not implemented! Disadvantaged and Marginalised: In our country, Dalits and OBC are discriminated, needs of girl child and disabled are neglected, religious and linguistic minorities are marginalized and poor in all social sections are put to many difficulties. A school should create a condition that no one should feel any difficulty due to any of the factors listed above. It should be a place of equality and provide equitable opportunity. But, many of our schools are not built and maintained so. Even teachers are not sensitive to different disadvantages. Smt. Smriti Irani, Minister for HRD again has stock answer for question raised by MPs in different occasions regarding disadvantaged sections of the children. However, the statistics speak otherwise. While the total Children With Special Needs (CWSN) enrolled in government schools is 23,48,646, the total Special Teachers appointed for them are only 19,778. On calculation we find it to be around 120:1 (not 20:1 it is 120:1). This shows how much attention is being given to the children with special needs. The total budgetary expenditure by central government is Rs 16,81,158 Crores for the financial year 2014-15. Expenditure by central government for building ramps in government schools in the same year is only 58.32 Crores! It is difficult to express the value in percentile points. It comes to be 0.0035% or otherwise 35 Rupees in Ten Lakh Rupees. Government has got so great a concern for the children with special needs! So, many schools till date do not have ramps. One should note here that needs of children with disability other than the loco-motor disability are totally ignored by the RTE Act. For example, there is no provision in it for blind, deaf and dumb and mentally disabled children. Tragically, this does not seems to be a matter of concern for the Parliament at all! Toilets, kits, Braille books, hearing aids and such things are but rare. If you want to know interest of the Central Government in the minority education, read the fantastic answer given by the HRD Minister to Q. No 262 dated 25th March 2015. “The Ministry of HRD implements two schemes under which funds have been earmarked for the educational empowerment of the minorities…. Scheme for Providing Quality Education in Madarsas (SPQEM) and Scheme for Infrastructural Development of private aided and unaided Minority Institutions (IDMI) (Elementary, Secondary, Senior Secondary Schools) … An amount of Rs 375.00 Crores has been earmarked for SPQEM and IDMI during the year 2014 – 15. Out of this, an amount of Rs 11.01 Crores has been released till date to 118 minority Institutions ….” So, the fact is that the government makes meagre allotments and even that meagre allotments are not released. Conclusion: The discussions in Lok Sabha in the given period do not lead us to anywhere. The questions raised are essentially trivial and stock answers were provided to each of the question casually. There is no effective debate on educational policies that are being pursued by the government. No question could be found on the saffronization of education even. The Parliament is not bothered about the move of the central government to give commitment for market access in higher education sector to WTO which, it is widely apprehended, risks the very sovereignty of the nation in the long run. It is really disturbing that the highest legislative body is not discussing the policy related questions in the field of education. It may be the need of the hour that the students’ organisations and teachers’ organisations debate more widely on educational policies and ultimately influence the Parliament to take the issues seriously. Otherwise the ruling and opposition parties can compromise on the critical interests of the people like education among themselves and with corporate forces leading to the distortion of the very development paradigm.